Postural fitness is a combination of many factors (See: Posture: An introduction). There's a long list of muscles involved in supporting the body's joints and structures. If you are really struggling with pain or postural dysfunction, it's always best to seek the advice of a qualified physical therapist or personal trainer. That said - in most of us, there are some common areas of tightness that can restrict you when you need to restore balance to your joints. This post focuses on some of the key stretches that help to offset the most common positions that we spend our days in (sitting at a desk, looking forward/down, using our arms in front of us). By improving mobility in these areas, you are likely to see significant increases in your flexibility at other joints/structures! This is based on many anatomical and physiological factors (to be detailed later). This stretch addresses tightness in the following structures: pectoralis major (both the clavicular and sternal head), pectoralis minor, the anterior deltoid, the coracobrachialis and the pectoral fascia. Starting position: Standing in a doorway, place the arms at 90 degrees of shoulder abd with about 90 degrees of elbow flexion. Place one foot forward (for support). Head and chest neutral with the abdominal muscles engaged (to protect the back). Then shift the weight forward as if "stepping through the door." You should feel a stretch across the front of the chest and arms. Dosage: Perform 3-4 repetitions of a 30-45 seconds hold. Do 5-7 times a week. 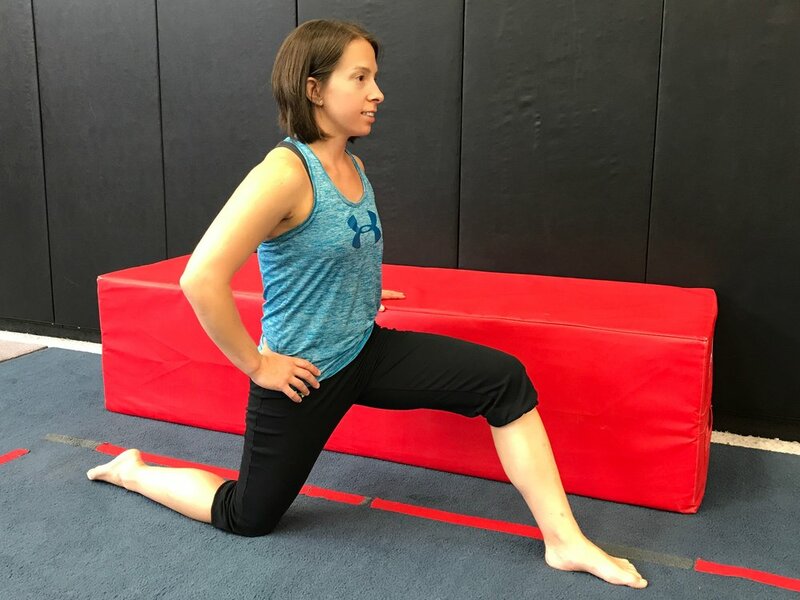 This stretch addresses tightness in the following structures: The hamstrings, the gastrocnemius, the soleus, the posterior capsule of the knee and the posterior nerves/fascia of the leg. Starting position: On the edge of a table/bed with the targeted leg straight. Back straight & toe up on that side. Using a strap, pull the foot/toes back and lean from the waist (keeping your back flat) until a stretch is felt in the back of the leg. Dosage: Hold for 30-45 seconds. Repeat 2-3 times per side. Do 5-7 days a week. This stretch addresses tightness in the following structures: The illiacus, the psoas major/minor, the rectus femoris and the anterior capsule of the hip. It plays a major role in restoring balance to the lumbar spine and addressing the flexion bias that exists because of our seated jobs. Kneeling in a lunge, with the bottom knee on a soft surface, flatten the low back by engaging the abdominal muscles. Then shift the weight forward until a stretch is felt in the front of the hip of the down leg. Be sure as you are lunging forward that 1) the front leg is sufficiently forward to ensure that the knee stays behind the toe and 2) the low back DOES NOT ARCH. You'll notice that you don't have to lean much to engage the stretch - so be careful not to lose the core control! Dosage: Hold for 30-45 seconds and repeat 2-3 times per side. Do 5-7 days a week. 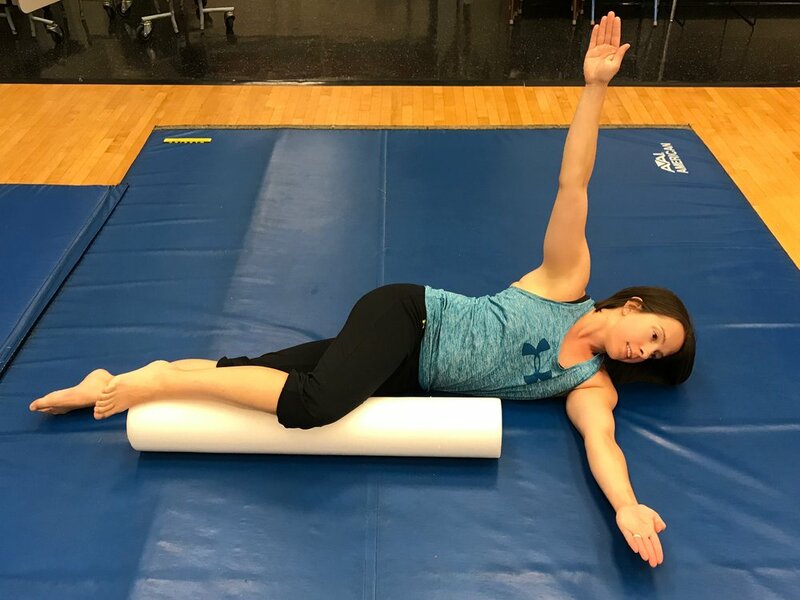 This stretch addresses tightness in the following structures: The thoracic spine and ribcage, the pectorals, the anterior neck, the abdominal obliques, and the fascia across the anterior torso and arms. Starting position: Begin on your side with a foam roll under the top knee as shown. With the arms together, extend them out directly in front of you. Keeping the knee on the roll, open the arms to create a "box" shape between the arms. 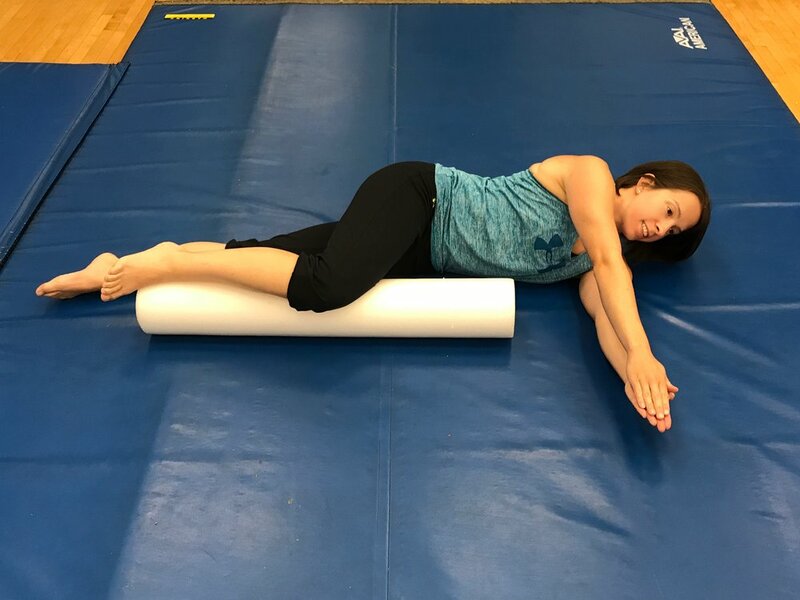 Then, while still keeping the knee on the roll, rotate "the box" by twisting the upper back such that the top arm is now touching the floor behind you. If you are able, reach the other arm up to the ceiling (think stretch/punch the shoulder forward) to increase the stretch. Dosage: Hold for 10 seconds. Do 10 repetitions per side. Be sure to breath freely when rotated. Perform on both sides. Do 5-7 days a week. Starting position: Hands and knees, abdominal muscles engaged. Back flat and head neutral. Then, round the back as much as possible - drop the head down to increase the stretch. Think of pressing the spine up into the ceiling. After than, drop the belly down and arch as much as possible. Lift the head to increase the stretch (*Note - I am sadly quite inflexible in this direction. You will likely see more motion). Dosage: Do 10 reps in each direction. Focus on pain-free motion and keeping the core engaged throughout. DO 5-7 days a week. Happy Stretching! As always, drop a comment below or email me with any questions that you have.